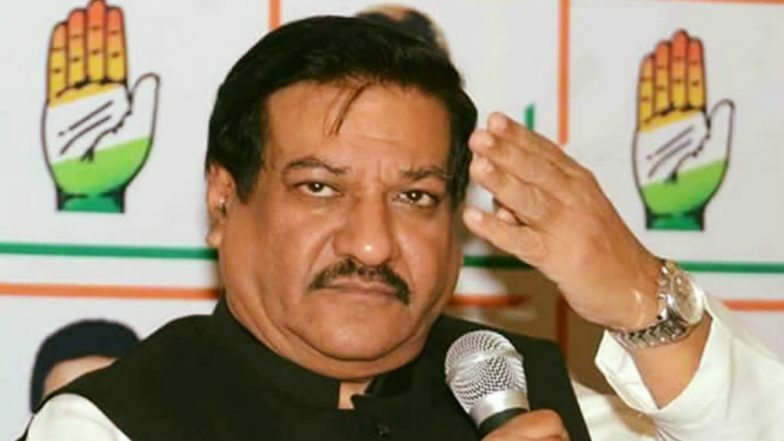 Mumbai, April 13: Senior Congress leader Prithviraj Chavan has lambasted the Narendra Modi government, calling it the "most corrupt" in the history of India, and said its performance has been "abysmal and deplorable". He also accused the BJP-led dispensation of misusing the sedition law, and said the Congress wants to differentiate between the anti-national acts and opposition to the government. Chavan claimed there was fear among people now that if Modi, who has "dictatorial tendencies", continued to be in power, the Indian democracy would be in trouble. Lok Sabha Elections 2019: Congress Attacks Smriti Irani Over Academic Qualification. In an interview to PTI, the former Maharashtra chief minister said in 2014, Modi had promised a corruption-free government. "In 2014, Modi emerged as the winner even before the campaign started. There were several corruption allegations against UPA-II, which people believed. Many of the allegations were fabricated. We could not effectively defend ourself. The Anna Hazare movement also created an atmosphere against us. Modi's corruption-free government promise was very important as many people voted him to power for that," Chavan said. "But, if you analyse his (track) record, it is abysmal and deplorable. Modi's government is the most corrupt in the history of India," he alleged. Chavan said, "People have now realised that these people had lied to them by giving promises which they had no intention of fulfilling. The former Union minister charged that Modi launched a surgical strike on Indian economy through demonetisation. Lok Sabha Elections 2019: In Poll Affidavit, Smriti Irani Says She Did Not Complete Graduation From Delhi University. "Performance of Modi is the agenda of the campaign this time. But, he has no answers on the development promises. Instead, he has shifted the focus on national security and wrong propaganda about the Congress and other opposition parties," Chavan said. "Post-Pulwama, lot of counter-narratives are floating around. Congress party will ask him questions about anything and everything. It is the right of the opposition to answer questions. The job of the opposition is to oppose, expose and depose the government," he said. Chavan said he expected the Congress-NCP to do better in this election as compared to the 2014 tally of two (Congress) and four (NCP) seats in the Lok Sabha polls in Maharashtra. "The mood of the nation has changed. The wave is against Modi. The opposition has sensed that the Modi government can be defeated. There is a genuine fear that if a man like Modi, with dictatorial tendencies, returns to power, there will be a question mark on the future of Indian democracy," he added. "We are happy with the 'tukde tukde' label. Let's not forget that it is the Congress party, which made 'tukde tukde' of Pakistan," he said, responding to BJP charge that the party manifesto is written by the "tukde tukde gang". The BJP has been using "tukde tukde" gang to refer to students accused of raising anti-India slogans in Jawaharlal Nehru University (JNU) in 2016 and has generalised the phrase to attack those it accuses of sympathising with Maoists and separatists. Congress party's record very clear, he said, adding that wars fought under the political leadership of the Congress have seen India decisively defeat Pakistan. When asked about the promise of review of sedition law in the Congress manifesto, Chavan said the party makes it clear that it wants to differentiate between the act against the nation and opposing the government. "There is a difference between anti-national acts of stealing defence secrets and selling it to Pakistan and saying demonetisation has been the most stupid decision of the Modi government," Chavan said. "It is the right of the opposition and every citizen to ask the government of the day for accountability. The sedition law was rarely used during the UPA rule. Now, the government is misusing it and there are 179 sedition cases in different parts of the country," he said. "In JNU, if somebody has a different point of view, do you arrest them under sedition?" he asked. He said the BJP's manifesto has consistently given place to issues of Ram temple, uniform civil code in the last three elections. Chavan said the Congress-led opposition has deliberately avoided a national alliance against the BJP since it would have to be under some leader. "This is what Modi wanted- to convert the election into a US presidential style campaign," he added. When asked about alliances, he said the Congress has 23 parties on board in the state-level alliances. "There are conflict of interests in some states. But, in a large country this is bound to happen. By and large, alliances are in place," he said. Targeting the BJP, he said on the issues of development, national welfare, the ruling party is no match to Congress. "All their promises have fallen flat. Hence, it is effectively using methods of coercion and inducement. Their motto is anything goes in politics...," he said. Lok Sabha Elections 2019: Congress Releases List of 7 Candidates, Jyotiraditya Scindia to Contest From Guna in MP. Referring to the I-T raids in Madhya Pradesh, Chavan said it was "tax terrorism". "To threaten and create an atmosphere of terror," he said.